Now in its 23rd Year Serving Animated STAR TREK Fans! Producing New Animated STAR TREK Episodes! 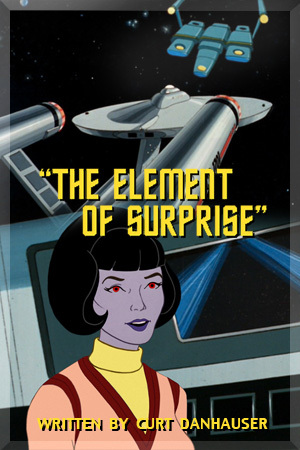 Welcome to my guide to the Animated STAR TREK series - the "forgotten" STAR TREK. Here the browser can relive the memories of seeing the show as a child or adult or discover the show for the first time. I, myself, was eleven years old when the Animated STAR TREK first aired. I invite you to enjoy this site and please feel free to drop me an e-mail if you have any questions or comments. Series History. In-depth story behind the 1973-1974 animated series. Episodes. List of episodes with links to the individual episode pages. Characters. List of series characters with links to individual cast-member pages. Timeline. 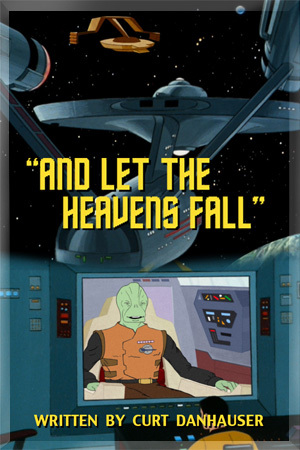 Chronological listing of dates and events mentioned in the Animated Star Trek series. Technology. List of ships and devices from the Animated STAR TREK series, with links to individual graphics/blueprint pages. Lifeforms. List of the aliens and creatures mentioned on the Animated STAR TREK series, with photos and descriptions of each. Personnel. List of all of the Starfleet members seen and mentioned on the Animated STAR TREK series, with photos and descriptions of each. Production. Complete listing of the writers and directors who worked on the Animated STAR TREK series. Also complete Show Credits and a look at how the show was produced. References. 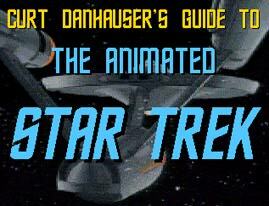 Books used by the author to create this Guide to Animated STAR TREK. What's New. Chronological listing of changes made to this site. Check this page to see what has been added recently. Filmation. Information about the production company that created the Animated STAR TREK series. Also included is a chronological listing of all of Filmation's productions. Writing for Limited Animation. Detailed treatment of the technique of limited animation including how best to write scripts for limited animation films especially the Saturday morning cartoon show. New Episodes. List of the new animated STAR TREK episodes created by Curt Danhauser with links to individual pages to allow viewing of these new animated films. Questions and Answers. Frequently asked questions regarding the Animated STAR TREK series along with their answers. Download the Animated STAR TREK Theme. Paramount Pictures Corporation. All Rights Reserved. Randy Hall over at Sci-Fi Pulse.Net reviewed my animated episode! Spoiler Alert! - The review gives away the story's ending. I've gotten a nice review by Bernd Schneider from the fantastic Ex Astris Scientia site! Spoiler Alert! - The review contains details of the story's twists and ending. the Animation Supercon in Miami Florida. Insiders Guide in the August 2009 issue. has been released on DVD with Extras! 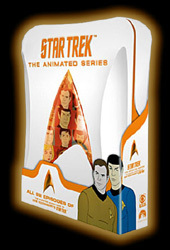 On November 21st, 2006, Paramount officially released Star Trek: The Animated Series on DVD. The packaging is shown at right and the suggested retail price is around $39, but it can be ordered from Amazon.com for around $24. What is especially noteworthy is that Paramount's announcements have listed several extras. "Drawn to the Final Frontier - The Making of Star Trek: The Animated Series"
"What's the Star Trek Connection?" Text Commentaries by Michael Okuda and Denise Okuda ("Yesteryear," "The Eye of the Beholder," "The Counter-Clock Incident"). Interview with Associate Producer/Story Editor/Writer D.C. Fontana. Director Hal Sutherland who helmed 20 of the 22 episodes. David Wise, the Co-Writer of the episode "How Sharper Than A Serpent's Tooth". Writer David Gerrold, talking about his episodes "Bem" and the original series tribbles sequel, "More Tribbles, More Troubles". Judith and Garfield Reese-Stevens (STAR TREK novelists, Enterprise Writers/Co-Producers, Co-Authors of several non-fiction Trek books including STAR TREK: Phase II, The Art of Star Trek and the tenth anniversary tome STAR TREK: The Next generation - The Continuing Mission) to discuss their perspective on the animated series' place in Trek history. Walter Koenig, writer of "The Infinite Vulcan" animated episode. Book About Writing For Television by Animated STAR TREK writer Larry Brody! 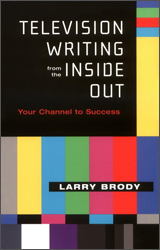 Television Writing from the Inside Out is a how-to book with a difference: Larry Brody is a television writer-producer who has helped shape the medium. The book is rooted in experience, and told in the breezy style that is the trademark of Brody and his award-winning website TVWriter.Com, which has helped launch the careers of many new writers. The information given by Brody and the manner in which he gives it has made him a writing guru to thousands of hopefuls.Television Writing from the Inside Out covers: what writing jobs are available; the format, structure and stages of teleplay development; tips on the writing of different genres - drama, comedy, action, the television film, soap opera, animation; and sample teleplays by Brody and others, with analyses of why they were written the way they were in terms of creativity, business, production and "insider politics. "Television Writing from the Inside Out presents all that Larry Brody has learned about writing, selling and surviving in the television industry. The best-kept secret in show business has been that it is a business, but Brody's readers will know the truth - and armed with their new knowledge, they will have a significant edge as they set out to conquer this fascinating field. Larry Brody is the author of the Animated STAR TREK episode "The Magicks of Megas-tu" and the 1995 STAR TREK: Voyager episode "Tattoo." Hailed as one of the fathers of Saturday morning television, Lou Scheimer was the co-founder of Filmation Studios, which for over 25 years provided animated excitement for TV and film. 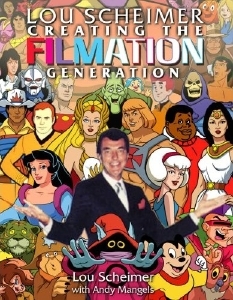 Always at the forefront, Scheimer's company created the first DC cartoons with Superman, Batman, and Aquaman, ruled the song charts with The Archies, kept Trekkie hope alive with the Emmy-winning Star Trek: The Animated Series, taught morals with Fat Albert and the Cosby Kids, and swung into high adventure with Tarzan, The Lone Ranger, and Zorro. Forays into live-action included Shazam! and The Secrets of Isis, plus groundbreaking special effects work on Jason of Star Command and others. And in the 1980s, Filmation single- handedly caused the syndication explosion with He-Man and the Masters of the Universe and its successors. Be sure to check out the Animated Adventures of the U.S.S. Farragut, also done in the Filmation style. I contributed some backgrounds to their laudable efforts. Here is an animation I created based on Frank Miller's Sin City. New STAR TREK S.C.E. Omnibus contains sequel to "The Time Trap" [TAS]. On December 11, 2007, the third Starfleet Corps of Engineers trade paperback collection will be published. The book collects eBooks #43 through 49 and is entitled "Star Trek: SCE: Creative Couplings." 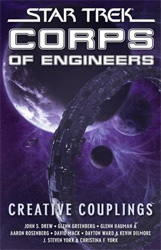 The book includes S.C.E. #44 "Where Time Stands Still" by Dayton Ward and Kevin Dilmore. As the original publishing was as an eBook, this will mark the first time this story appears in print! I said "Yes", of course, and to make a long story short, one year later, in September 2004, their book was published. It is entitled STAR TREK - Starfleet Corps of Engineers #44: Where Time Stands Still and it is a really great read. In addition to its being an exciting adventure story, it is also important because it is the first novel published by Pocket Books to directly acknowledge and tie-in with events from the Animated STAR TREK series. It also reconciles some of the events of Starfleet's early history as described by the Enterprise and Animated STAR TREK series. I encourage all lovers of good adventure and especially fans of the Animated STAR TREK to get Starfleet Corps of Engineers #44 - if only to find out the fate of my namesake. Below is a synopsis of the book and a handy link to Simon & Shuster's page for the book for purchasing. In August 2002, I began working with Steve Charendoff president of Rittenhouse Archives on the creation of an Animated STAR TREK Trading Card set. I was employed to write the synopses and the secondary (behind-the-scenes) text for the deluxe 198-card set. I was also provided with several thousand screen captures from the 22 episodes and asked to choose the 396 images that would grace the fronts and backs of the cards. 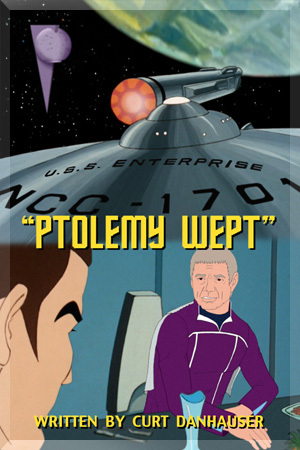 In addition, I wrote the bridge crew biographies and provided detailed voice credits for the James Doohan tribute cards. I completed the writing and graphic task on Dec. 31, 2002 and the card set which was slated for a February 2003 release finally hit the streets in March 2003. The card set turned out beautifully, and only a few text errors made their way into the cards after my material was turned in. In regards to graphics, only a few incorrect images and a smattering of incorrectly recolored characters are evident in the final set. It is about time that the Forgotten STAR TREK Series got the full trading card treatment.